A friend and I had a wonderful insight on Sunday: Good Ecology = Healthy Human Communities. More specifically, we were brainstorming methods that might work to repair, restore, and build healthy communities out of nothing, or out of broken and abandoned social environments. Developing a healthy ecology out of overworked or untended earth requires a depth of care and slow, intentional practice over many years. You need to create good soil and healthy plants in every growth environment, from marshes to grasslands to orchards and forests. Just as you need to develop physical, emotional, and psychological support for every type of person and situation in small community to create a basis for positive change. I don't pretend to know much about ecology -- my friend James, who I was talking with, is far more knowledgable than I am. But I know enough to be able to say that earth systems, though fragile, can be made strong with right practices. As can human communities. I have a sense that permaculture and good ecology are correlative to developing perma-culture for us, as people, as enactors of culture, as farmers of new, lasting, enriching change in our towns and cities and countries. It's a concept I'm going to further explore. And one I encourage you all to add your two cents on! Please, comment and let me know your thoughts. Is this inspiring to you? Do you sense what I'm getting at? But enough of that. These grits are something special, and that's the real reason you're here! Have I ever been so in love with Basil? I remember years where basil played a significant role in my exploration of vegan pesto, and might have been shredded into a salad, layered on a sandwich, or the like. But this year I hold a renewed appreciation for the mildly bitter tasting, sweet smelling green. I rip it from fresh stems by the handful and pile it on whatever I'm eating. Last nights dinner was a simple bowl of sautéed tempeh, broccoli, and boiled purple fleshed potatoes with some ghee and J.Q. Dickinson salt as a dressing, with a pile of torn basil leaves folded in. And it was heavenly. Simple and perfect. I notice that I don't post savory recipes here that often, and I want to change that. Just because a savory dish is simple doesn't mean it's not worthy of this blog! The main reason I don't post savory recipes that often is because they tend to lack a certain prettiness which I've been challenging myself to create. Messy, savory foods are a whole new challenge. One that I think it's about time I gathered the courage to tackle OFTEN and with vigor. I'm going to jump on to the moving train that is savory food photography and make some good sh*t happen. And HEY the J. Q. Dickinson salt giveaway is still happening! It's going on until July 10th, so there's plenty of time to enter, or to get more entries if you've already participated. Are you guys a fan of grits? I love them. For years growing up, I never really got grits. I mean, boiled corn mash? Boring. But that was back in the day when mama rocked instant grits with some butter and salt and called it a day. My papa is a grits lover, but without loads of cheese mixed in I really couldn't be bothered. But now I know that slow cooking grits brings out the sweetness in the corn. And boiling grits in vegetable broth gives them a delicious depth of flavor. And topping them with pesto is worthy of some daps. Oh! And teff! Teff is amazing. It's high in iron, magnesium, phosphorous, potassium, and manganese. And there are 26 grams of protein in a serving! It has a very mild earthy flavor, much milder than amaranth. The seeds (yes, it's actually a seed not a grain) are teeny tiny, smaller than poppy seeds. They cook up well as a breakfast cereal, but add another layer of nutrition in this grits recipe. It's a delicious lunch on its own and packs up nicely for potlucks if you quadruple the recipe. Enjoy, ya'll! 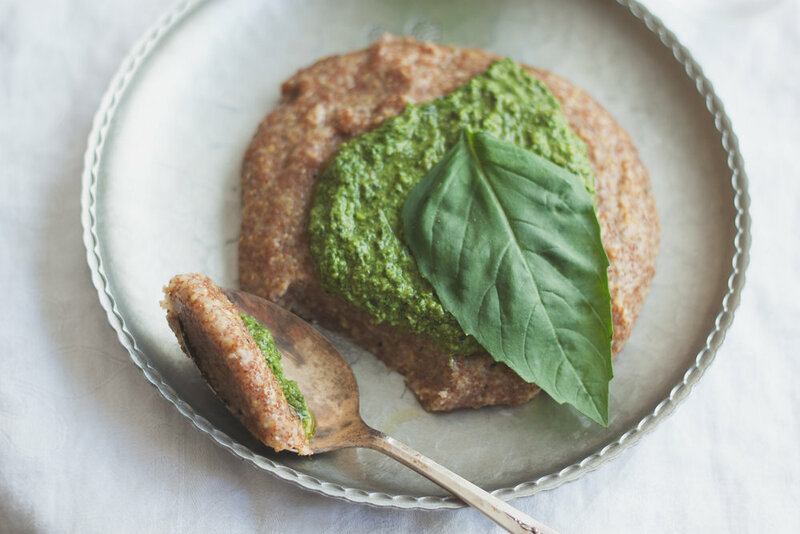 These pesto-topped grits are savory and nutritious, with tons of protein, calcium, iron and essential minerals from the teff. The sweet, aromatic, creamy pesto makes this a Summer seasonal lunch or dinner accompaniment. Mix teff and corn grits in a small bowl. In a small to medium stock pot, bring 3 cups vegetable broth to a boil. Slow pour in teff and corn grits while stirring with a whisk -- to prevent lumps. Add yogurt or cashew cream and cook 5 minutes more. For the pesto: Add basil, olive oil, and walnuts to a blender or Cuisinart. Pulse to combine for about 10 seconds. Add feta, nutritional yeast, salt, and lemon juice. Blend until creamy and smooth, about 30 seconds. To serve, spoon out grits onto a plate and top with pesto and a basil leaf.